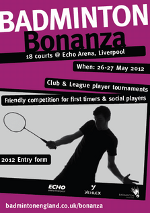 In its third year, the Liverpool Badminton Bonanza will once again be taking place at the ECHO Arena. This year it will be taking place on Saturday 26th and Sunday 27th May 2012. To download the information booklet and entry form click here. Alternatively, enter online by clicking here. The deadline for entries is 4th May 2012.